Even the best dishwasher can leave cookware crusty when you don't give it a quick scrub before loading it into the machine. 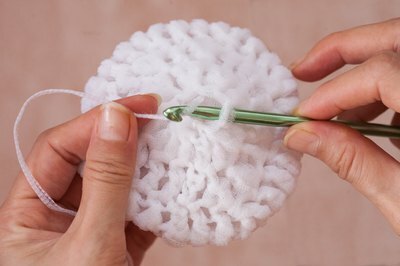 If you can crochet a simple circle, you have all the skills necessary to whip up a nylon-netting pot scrubber that can remove stuck-on food residue without scratching even nonstick coatings. Nylon netting comes in a rainbow of colors and styles. For a sturdy pot scrubber, select netting with a slightly rough texture and easy-to-see hexagonal holes, rather than fine, soft tulle netting. Lay your yard of netting out on the floor or table so it's folded into a long rectangle, as it came off the bolt. Cut the netting into 1- to 1 1/2-inch strips measured with the ruler down the length of the folded rectangle, cutting perpendicular to the end of the fabric for the longest strips. 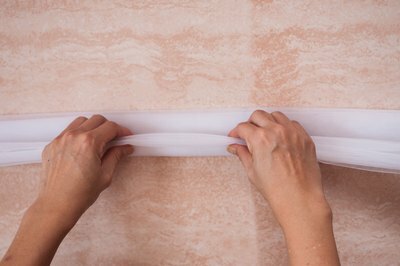 Tie the ends of the strips together with a simple square knot to form one continuous strand. Wind the strand into a ball. 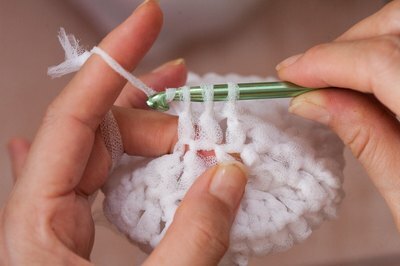 Tie the free end of the strand of nylon net into a slip knot and place the loop over a medium-sized crochet hook, from size H to J, and chain four. Slip-stitch into the first chain to form a circle. The netting strip naturally compresses into a strand, about the same gauge as bulky yarn, as you work. Single crochet eight times into the circle and slip-stitch into the top of the first single crochet to end the first round. Chain three. Double crochet twice into each single crochet around, slip-stitching into the second chain to finish the second round. Chain three. Increase the size of your circle in either double or single crochet until it is 3 to 4 inches in diameter. The technique for increasing a circle is to stitch twice into the first stitch of a round and once into the second stitch, and then repeat the sequence to the end of the round. In additional rounds, stitch twice into one stitch, then once into the next two stitches and repeat. Increase the number of single stitches in the repeating sequence by one in each round until your circle the right size. Chain two at the end of each round if you single crochet, and three if you double crochet. Decrease the number of single stitches in a repeating sequence by one for each round to create a double-sided pot scrubber. 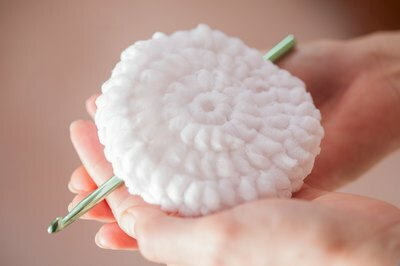 As the circle gets smaller, it forms a pillowy pad for a more durable scrubber. Slip-stitch to join the round, and chain two at the end of each round except the last. Join the last round with a slip-stitch and cut the netting yarn with scissors, leaving a 6-inch tail. Pull the tail through the last stitch with your crochet hook. Weave several inches of the tail into the pot scrubber by catching it with your hook and pulling it through previous stitches. Cut off any excess.